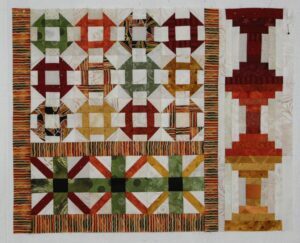 The block for week 8 of the Long Time Gone sew-along is Courthouse Steps blocks. It works so much better for me to assemble the sections together as much as possible. 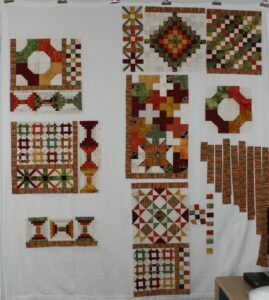 The quilt will come together faster at the end as well as helping me balance the colors throughout the top. 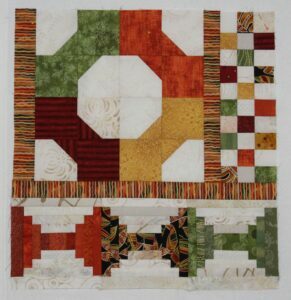 This is one of my favorite sections so far – the diagonals in the Cross of UK are from left to right red, orange & yellow and the Courthouse Steps are from bottom to top yellow, orange & red. My daughter called these blocks barbells. I wanted the last three blocks to be totally different so in addition to using multiple colors in each block I also changed direction of the blocks. In the next couple of weeks this project will need to move to a larger design wall. I have also been sewing the checkerboard connector blocks as leader/enders. My autumn Long Time Gone project is bright, bold and full of contrast – I am very happy with it. I’m kinda regretting I didn’t join in, but I don’t really need another UFO. Yours is looking great!